Here at Saddleman we know that you care about your truck's seats, what better way to protect them without limiting who and what go into your truck than truck seat covers. You're at work? No problem what so ever, we've got you covered! You at home? 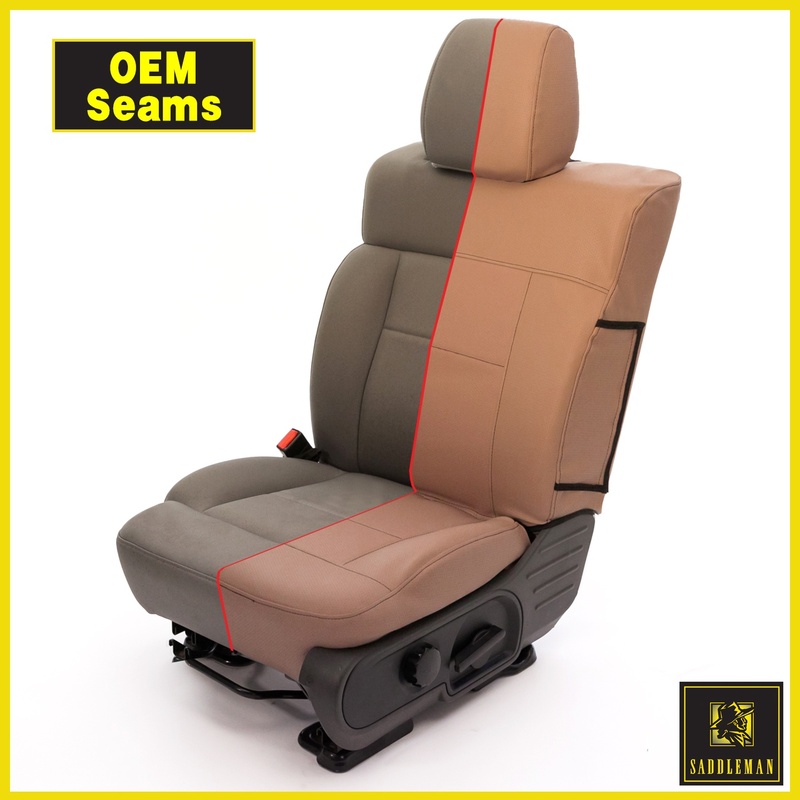 Great, its time for some leisure, you don't have to sacrifice your seats or your style anymore with Saddleman's custom truck seat covers. Saddleman's truck seat covers come in your choice of fabric and color! With Saddleman's fabric and color options anyone can find something to their liking. With Saddleman's many options of color and fabric you will find yourself wondering how you haven't already gotten your own set, so why don't you, come join us now and buy your set today! Our Saddle Blanket seat covers are the only saddle blanket seat covers on the market that have almost full coverage, you wont be able to find any more durable truck seat covers than this. Our Saddle Blanket seat covers have long been described as one of the only true saddle blanket seat covers on the market, with others out there adding only a small patch of saddle blanket, with our saddle blanket seat covers you'll find yourself feeling like you're back in the old west riding your trusty steed across the dusty desert. Don't be the only one left without a stylish and rugged truck seat cover. Saddleman's seat covers will protect your new seats, keeping them looking clean and fresh, basically looking like it just came off of the manufacturer's assembly line or they can revitalize your older vehicles worn out, torn up, beaten up seats with our stylish choices of seat covers for your truck! Our fabric options range from our durability line, which includes our Saddle Blanket seat covers, all the way to our comfort lines, Saddleman's very own Microsuede line is some of the softest fabric around! Can't stand that you don't have a seat of custom seat covers for your vehicle? well you can order today by clicking on the button below! 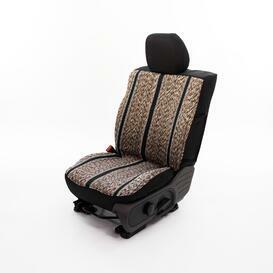 Saddleman seat covers literally has thousands of patterns to choose from, with vehicles going back as far as the 80s. You must be thinking, how can you possibly provide instructions for all of those different patterns? 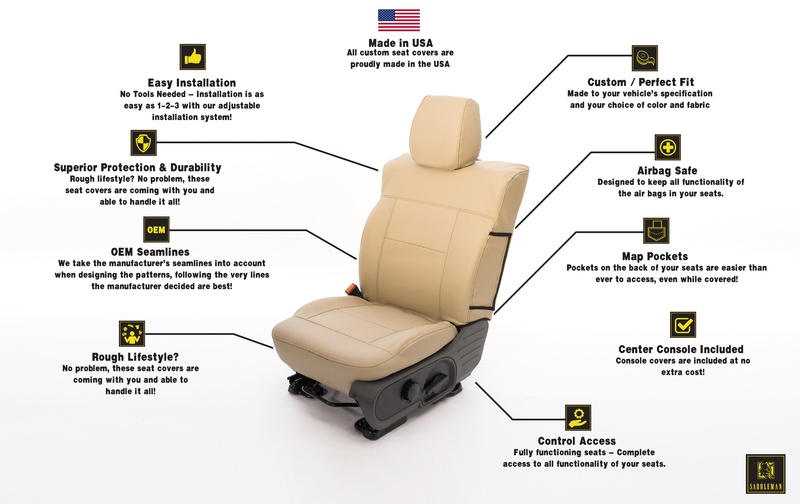 With our new installation guide you'll easily find your correct seat style and find that every seat style is available with our instructions on how to install the best custom seat covers on the market! This process was made even easier with the new adjustable installation system that Saddleman seat covers, now you can make sure the fit is to your liking on your very own custom seat cover for trucks or cars. While the new installation system does make things a lot easier for you, the customer, we understand that at times with certain vehicles things can get a bit tricky, for those situations we have our friendly customer service representatives that can help you with any issue you might be having, whether its a simple installation question or if your having some kind of issue with your seat covers, we're here to help! Our friendly customer service is available at all times during the work week from 9 am to 5:30 pm EST we can be reached at 1800-883-9919, there you can find help finding which pattern is best suited for your vehicle, as well as get suggestions of fabric for your needs and an extra set of eyes on whats going to look good in your vehicle. With our help the guess work is taken out and our experienced staff will help you pick out exactly what you need. Get your set of Saddleman seat covers today and make sure you're covered! Saddleman custom truck seat covers are first to the market with every year's new updates to your favorite vehicle models. Don't see your vehicle listed? Thats absolutely not a problem, your custom truck seat covers are a call away, we happily model new vehicles for all customers that might have been over looked originally and every new vehicle that is modeled includes any console covers or map pockets that may be included with your vehicle's original seats, all without any additional charge! Saddleman's truck seat covers such as the 2018 Ford F-150 add a stylish fabric to our truck's already stylish seats, here at Saddleman we work with the manufacturer, not against, by using the original manufacturer's seam lines, the effort the manufacturer put into designing your seats are not lost! Saddleman's stylish design and ease of installation makes these seat covers your number one choice for new and old trucks of all shape, sizes and models. Saddleman's new lines of fabrics have been reinforced and padded, taking our already strong material and not only making it stronger, but more comfortable as well, the seat covers have never been so plush or durable before, making our already impressive seat covers and improved it even more. You'll turn any ratty seat into a fresh new seat in no time or if your seats already look nice, how about protecting them from all the messes the world can possibly through your way. If you want to have your vehicle modeled as it doesn't show up on our list of vehicles available give us a call at 1-800-883-9919 and we'll be happy to take your information and go find your exact vehicle to model it out right then! All new trucks deserve all new truck seat covers, get your all new seat cover patterns for your truck today! Saddleman is proud to announce that we have an exciting new installation system. 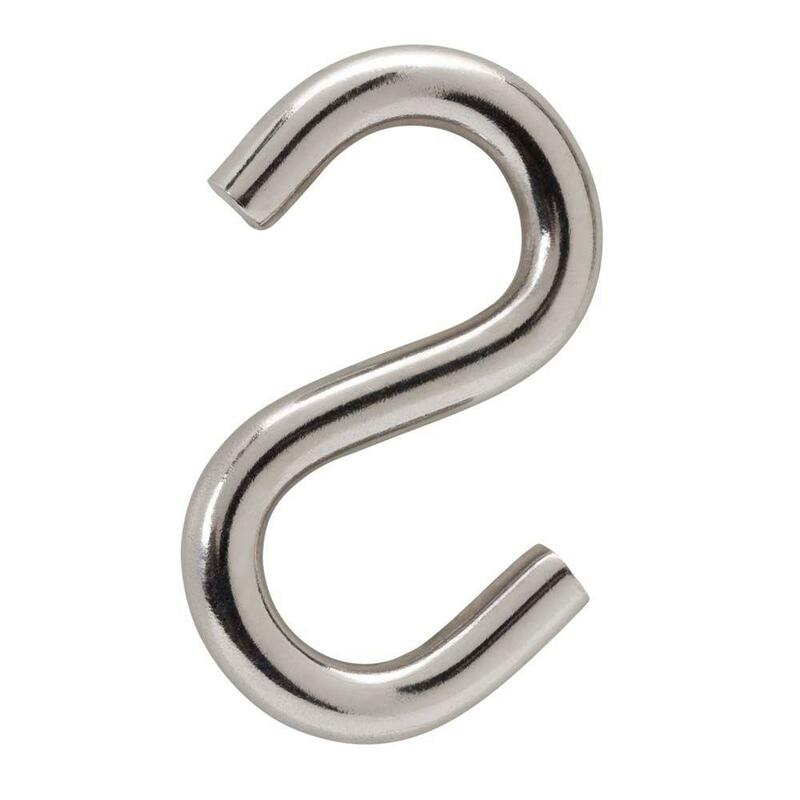 This new system will replace our previous hook system which at times could be a little tricky, with a much easier adjustable installation system. 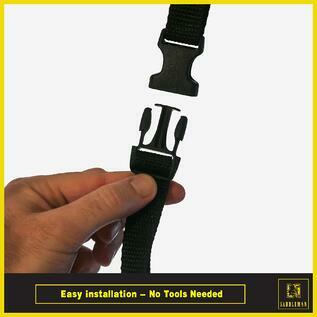 Our new adjustable installation system uses buckles instead of our previous hook system. Now you can simply buckle the seat covers and then adjust. This system will not only improve the ease of installation, but will allow for your custom seat covers to fit even better! Our car seat covers have always been easy to install, especially with our detailed instruction booklet that comes with each and every order! Our seat covers used to be as easy as 1-2-3 to install, but now, forget about having to deal with those hooks and out of reach places, now you just need to slide one end of the buckle right into the other end and SNAP, its locked in place! This simple innovation to our already easy to use system makes installing your new custom auto seat covers a breeze, but the new adjustable installation system isn't just easier, it also helps hold the actual seat cover in place, with a sturdier hold and adjustable fit, to make your custom seat covers fit just the way you like! 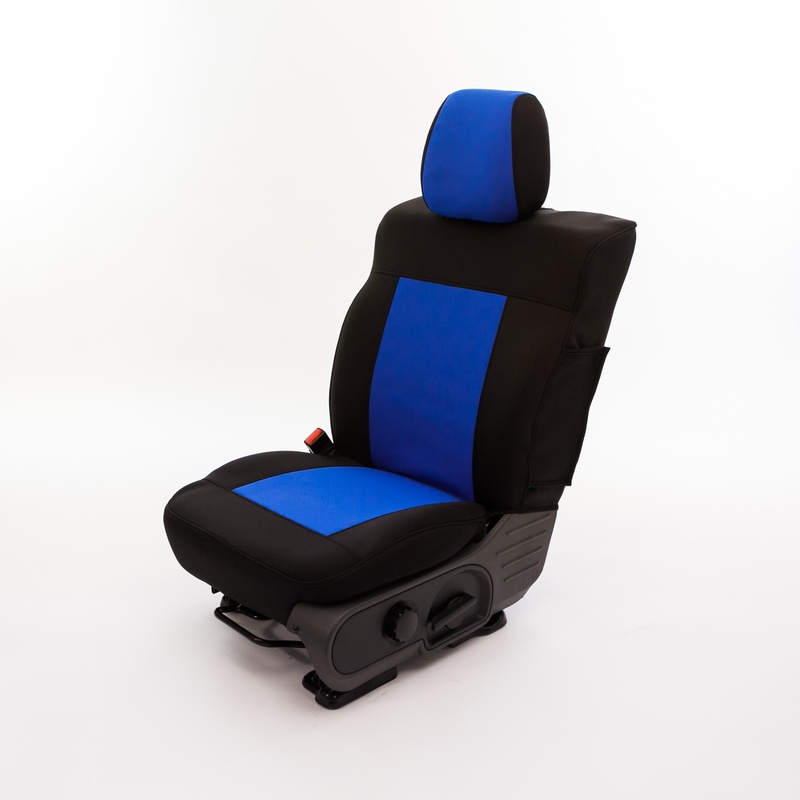 With all of these changes a great product just became even better, these quality custom auto seat covers will refresh you vehicles interior and with our new adjustable installation system the fit that will come with these car or truck seat covers are going to keep your seats looking like and feeling like they're brand new. So come order your own set today and see for yourself the level of satisfaction you'll achieve, by simply clicking below!